01. Close button is missing in video lightbox popup? If you are using CSS/JS merge and hence module cannot understand the proper path of Lightbox popup close button but if you unmerge it then it should work fine by default. Anyway you just need to do below change to make it working in merge CSS/JS also. Please flush your Magento cache and then it should work fine. 02. How to set product video in loop? The loop attribute – When present, it specifies that the video will start over again, every time it is finished. Add Loop for videos under product thumb image list. tep 1: Open file app/design/frontend/base/default/template/video/product/view/media.phtml or same file from your custom theme. (For Youtube Video): Go to line #43 and replace href tag with below one. (For Vimeo Video): Go to line #53 and replace href tag with below one. Go to line #1043 and replace it with below one. 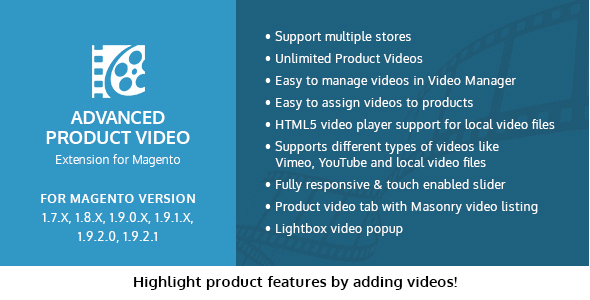 Add Loop for videos for product video list with masonry. Step 3: Open file app/design/frontend/base/default/template/video/video_list.phtml or same file from your custom theme. (For Youtube Video): Go to line# 25 and replace iframe code with below one. (For Vimeo Video): Go to line #30 and replace iframe code with below one. (For HTML5 Video): Go to line #33 and replace code with below one. You needs to add our video code in ultimo theme. Step 1 – Please take backup of below two files. /app/design/frontend/ultimo/default/template/infortis/cloudzoom/product/view/media.phtml Add this code at the end file. Step 4 – Clear / Refresh magento cache and check product page. Check our video and watch how it is easy to setup Product Video Extension and how it works. This will take just few minutes.